I admit I do go out and get my tan on sometimes. But I do believe that self tanner is really the way to go for a strong bronze! 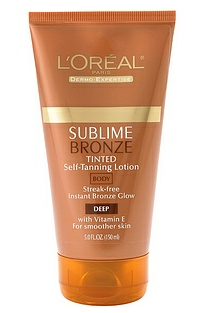 So far this L'Oreal Sublime Bronze Self-Tanning Lotion has got to be my recommendation! The Deep level is perfect if you've got a mixed background with a bit of tan like me. Best of all, you can buy at any drugstore or Drugstore.com for just $9!